This cute little Sea Turtle is approximately 9 inches long, 8 inches wide, and 3 inches high!! This cute Sea Turtle is approximately 14 inches long, 11 inches wide, and 4 inches high!! This is a cute Little Turtle keychain that is approximately 3 1/2 inches long, 2 inches wide and 1 1/2 inches high. His name is "Shellby" and his birthday is February 21. My pink shell looks good on me!! 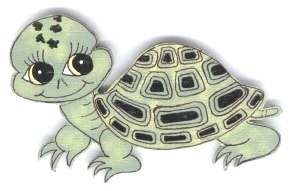 This is a cute Little Turtle keychain that is approximately 3 1/2 inches long, 2 inches wide and 1 1/2 inches high. His name is "Slowpoke" and his birthday is August 18. At a very very slow pace! This is a cute Little Turtle keychain that is approximately 3 1/2 inches long, 2 inches wide and 1 1/2 inches high. His name is "Sparkles" and his birthday is November 29. Jump in the water and swim with me! This is a cute Little Turtle keychain that is approximately 3 1/2 inches long, 2 inches wide and 1 1/2 inches high. His name is "Owlivers" and his birthday is July 10. Owl's take flight at mid night! This is a cute Little Turtle keychain that is approximately 3 1/2 inches long, 2 inches wide and 1 1/2 inches high. His name is "Zippy" and his birthday is May 6. And then I rest on the beach in the sun! This cute Purple Turtle is approximately 9 inches long, 5 inches wide, and 3 inches high! !